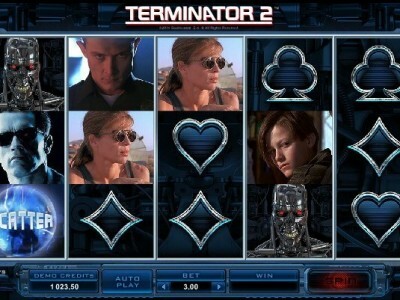 Terminator 2 online pokies is themed exclusively on the Hollywood Blockbuster movie Terminator 2: Judgement Day, featuring video graphics from the movie and symbols of your favourite characters. This online pokie plays out as an action-packed 5 reel, 243 ways to win in the base game and a massive 1024 ways during the Free Spins round! The game is loaded with wilds, scatters, the incredible T-800 and T-1000 bonuses, including a huge 88,000-coin progressive jackpot. In order to receive big payouts try to win the following..
Three scatters will win you the free spins, the special T-1000 symbol can appear and turn into any other character symbol in order to win more. Play Terminator 2 pokies and say “Hasta La Vista, Baby“ to all other games as you encounter the exciting thrill of an action packed game that has good bonuses and payouts.